Got questions about SIP Trunking? We have the SIP Trunking experience to answer your questions. Session Initiation Protocol (SIP) is used for initiating concurrent connections within an IP infrastructure. A connection—or session—could refer to anything from a 2-way phone call to a multi-party video conference. The ability of SIP to integrate multiple types of devices is one of its primary advantages. Will I need more bandwidth? Possibly. SIP Trunks prioritize voice over data transmission, therefore if many concurrent voice calls are taking place data transmission may slow down. In order to maintain exceptional internet speeds and call quality, we recommend purchasing a dedicated internet connection from BroadConnect for voice communications. Not only is SIP Trunking typically much cheaper to install and maintain than analogue lines, but it also provides enhanced features and functionality solving many problems of scalability and integrated communications faced by today’s businesses. Reduce Hardware Costs SIP immediately reduces costs by eliminating the need to purchase ISDN, PRIs, or PSTN gateways. Reduce Monthly Costs By converging voice and data transmission, SIP reduces monthly carrier costs. Simplified Infrastructure SIP Trunking reduces the number of connection points by eliminating PRI and PSTN gateways, which is great for Call Center VoIP systems. In conjunction with our fully redundant disaster recovery protocols, this assures constant connectivity and minimizes the risk of downtime as a result of component failure. Scalability With a TDM-based PRI system one must add new service in blocks of 23 trunks, with each block requiring a new gateway to interact with the PSTN gateway. But in a SIP Trunking scenario, you can increase (or reduce) your capacity by as little as one trunk at a time. Disaster Recovery Full Redundancy ensures system availability in the event of component failure. A power outage or a natural disaster could mean failure of your IP-PBX. With our SIP trunking service, however, if your IP-PBX fails, then a backup will take over, ensuring no loss or disruption. All Calls can be routed to another office, Cell Phone, or Voicemail until your IP-PBX is back up online. Furthermore, because your PSTN access comes from our centralized Data Center, your service is protected in case of an on-premise IP-PBX failure or through our redundancy network. This means that you can move your service, seamlessly, from one location to another. Simplified Administration With SIP Trunking, adding new VoIP service for business locations to the existing voice network is not only fast and easy but also doesn’t require any hardware changes. Trunks can be added and removed on a case by case basis using a simple, intuitive, web interface. Trunks are purchased according to the number of anticipated simultaneous calls in an organization. If you find you need more call capacity, you can simply add trunks as needed. The process is quick and simple to gain the best VoIP solution. SIP Trunks work with an IP-PBX. BroadConnect will be able to provide you with one as part of our business IP phone service. 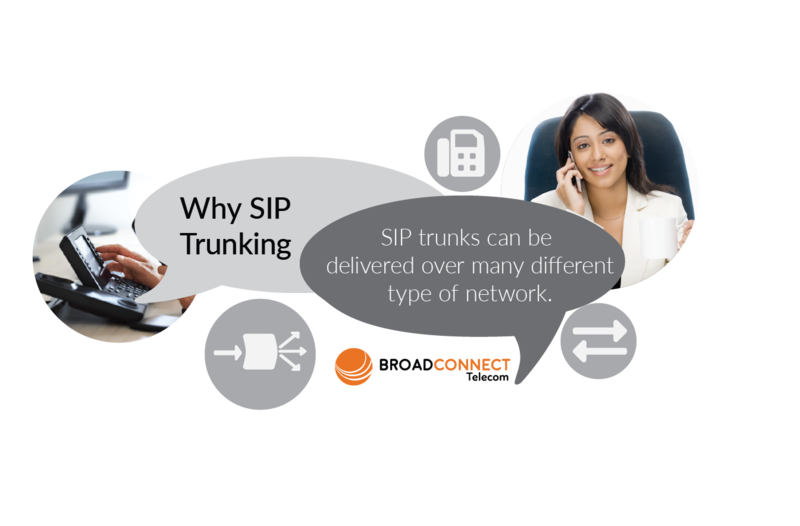 An SIP Trunk is a dedicated circuit used to carry a voice call routed over an IP Network as opposed to the Public Switched Telephone Network (PSTN). BroadConnect makes up the top tier of SIP Trunking providers because we are directly connected to the PSTN. Each customer is connected to the PSTN through our Data Centre with SIP Trunks via their IP-PBX. SIP Trunks transmit voice calls over an IP Network, allowing the customer to have a single IP Network where other forms of data transmissions occur, which reduces overall IT management and administration.